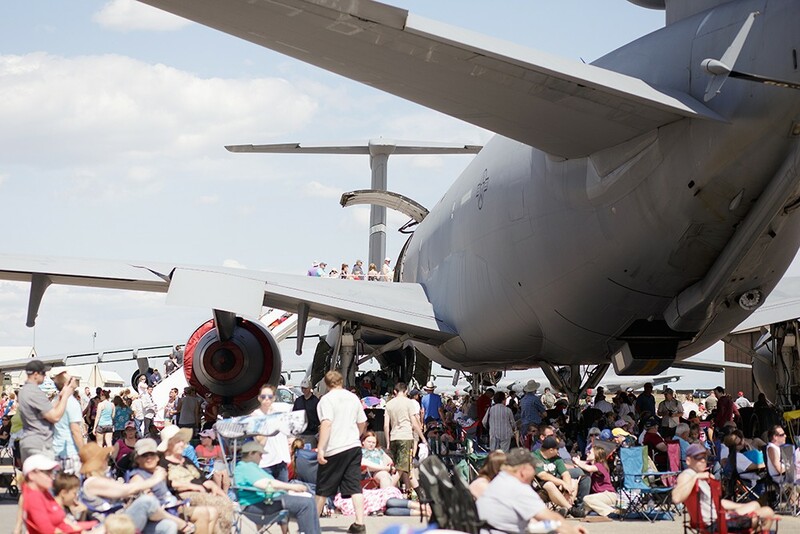 Skyfest is back at Fairchild to celebrate the base's 75th anniversary. This weekend, Fairchild's focus turns away from air refueling routines to some of the most spectacular piloting the Air Force has to offer. Fairchild Air Force Base has attracted special guests alongside a wide array of demonstrations to celebrate its 75th anniversary. Attendees will have the unique opportunity to watch the world's most talented stunt pilots and air performers soar over Fairchild for free on July 29 and 30. The celebration's most anticipated performance, the United States Air Force THUNDERBIRDS, last appeared at Fairchild in 2014's Skyfest. Six pilots will perform formation maneuvers, as well as some solo demos, showing off the skills of the Air Force's most talented pilots in an hour-long demonstration. The stunt team has a 64-year history of dazzling audiences around the world. Their aircraft of choice is the supersonic F-16C fighter jet, which costs nearly $19 million each. The nimble "Fighting Falcon" can reach speeds of up to 1,500 miles per hour, but performing speeds are much lower. The diamond loop is a staple opening maneuver of the Thunderbirds. Four pilots fly in a diamond formation, with just three feet between the tips of their wings, and pull a massive loop in unison. Some stunts involve the whole team; some involve just one pilot. Jumping from the behemoth C-130 Hercules, the WINGS OF BLUE will dive from thousands of feet above the venue. The parachuting team is also an Air Force tradition, dating back to 1962 when a group of Air Force Academy cadets began jumping from local pilots' planes with survival parachutes without the Academy's approval. The group today is much different. Each member of the Wings of Blue team is a certified basic free-fall parachuting instructor or jumpmaster. With the Wings of Blue's help, hundreds of cadets complete five jumps to earn their parachutist badge. The stunt group brings their countless hours of experience and unparalleled skill to every show, where they perform in groups as large as 14 jumpers, demonstrating diving and parachuting formations. Upon landing, the Wings move to the audience for autographs and pictures. Apart from the military demonstrations, career stunt pilot JACQUIE B. WARDA will perform 10 minutes of aerial maneuvers only possible in her specifically engineered Extra 300 monoplane. Beginning her high-flying career at the age of 50, Warda, who practiced flying at Felts Field, claims on her website that she was the first woman to enter the industry of solo aerobatics. Now 63, she has performed at air shows all around the world, including the prestigious Al Ain Air Championship in the United Arab Emirates, where she was the first woman to do so. The origin of her love for flying came from going to air shows with her father, who was also a pilot. Before becoming a stunt pilot, she was a private pilot as well as a biplane racer. With thousands of hours of flying experience, Warda's low-altitude stunts are sure to wow the crowd. Not all of the performers will be in the cockpit. Carol Pilon and Kelly Garvin perform with their feet firmly planted on the wings of a fire-engine-red biplane with THIRD STRIKE WINGWALKING. Performing separately, Pilon and Garvin begin their shows clinging to the struts between the wings and holding on tight through loops, corkscrews and barrel rolls. They carefully climb up the plane and stand on the top wing with their arms in the air. Taking it a step further, Pilon and Garvin seemingly defy gravity, standing tall through steep turns and loops. According to Third Strike Wingwalking's website, they value preserving the historical traditions of wingwalking, which includes performing without parachutes. Gates open to the public at 9 am, with the feature show scheduled to run from 11am-4 pm. All events are planned to take place both days. Tickets for guaranteed seats near the show are available online for $12 to $19. Tickets for exclusive seating, shaded lounge, light breakfast, lunch buffet and afternoon snacks are also available online ($29 for kids; $79 for adults). Members of the military receive a 10 percent discount.